Academic experts from different disciplines discuss diverse approaches to model the birth, diffusion, and adoption of innovations in science and technology. Temporal dynamics, diffusion trajectories, and the impact of interventions are covered. 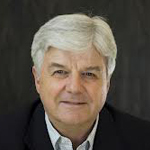 Bio: Richard B. Freeman holds the Herbert Ascherman Chair in Economics at Harvard University. He is Faculty co-Director of the Labor and Worklife Program at the Harvard Law School, and of the Harvard Center for Green Buildings and Cities. He directs the National Bureau of Economic Research Science Engineering Workforce Project. He is senior researcher at the LSE’s Centre for Economic performance and a Fellow of the American Academy of Arts and Science and the AAAS. Professor Freeman has served on 11 Panels and Boards of the U.S. National Academy of Science, largely dealing with science and engineering workforce issues. 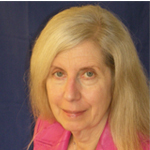 Freeman received the Mincer Lifetime Achievement Prize from the Society of Labor Economics in 2006. In 2007 he was awarded the IZA Prize in Labor Economics. In 2011 he was appointed Frances Perkins Fellow of the American Academy of Political and Social Science. View his website here. Abstract: Intuition, judgment, creativity are basically expressions of capabilities for recognition and response based upon experience and knowledge (p. 128–129)” (Simon, 1997). Workers gain experience and knowledge in the course of their normal jobs. Therefore, innovative ideas can be generated from knowledge built from learning opportunities across the firm (not just the R&D lab). Employees working for different functions (R&D and outside of R&D) in an organization have different work practices and build their learning through different processes. Moreover, the relative effectiveness of learning by different work practices for innovation is contingent on the nature of knowledge, characterized by generality (i.e., high mobility/transferability) and visibility (i.e., tighter links between actions and outcomes). Using multiple datasets combining public and private data and focusing on births of innovations, this study shows how the nature of knowledge affects differences in the innovation productivity of R&D and non-R&D work. The paper concludes with a discussion of the implications of these insights for innovation management and policy. Bio: John P. Walsh is Professor of Public Policy at Georgia Institute of Technology. He teaches and does research on science, technology and innovation, using a sociological perspective that focuses on organizations and work to explain how research organizations respond to changes in their policy environment. Recent work includes studies of organization and creativity in scientific teams; the effects of knowledge environments on non-R&D innovation; academic entrepreneurship in the US and Japan; and country and industry differences in the role of patents in firm strategy. He is also an Editor at Research Policy. His work has been published in Science, American Sociological Review, Research Policy, Social Studies of Science, and Management Science. His work has been funded by the National Science Foundation, the Japanese Society for the Promotion of Science, the Ewing Marion Kauffman Foundation, the Matsushita Foundation and the Japan Foundation, and he has done consulting for the National Academy of Sciences, the OECD, the European Commission and the American Association for the Advancement of Science. Abstract: Many paths to sharing or selling access to scientific knowledge have been documented, but which ones really matter? Though many different bridges exist, we focus those central to the “corporate-academic” model. This model emphasizes attracting the best and brightest scientists, providing them with a commensurate increase in autonomy including initiation of bench-level collaborations with top university scientists in which valuable tacit knowledge is transferred in both directions. More generally, this basic model of knowledge flow holds whenever two organizations, or person, hold different protected knowledge content (tacit if natural excludable; codified if protected by law, patent or trade secret) which if put together yield significantly higher returns to both organizations/persons compared to alternative use (Zucker and Darby 2014). We propose and test two strong knowledge bridges as indicators of adoption of the corporate-academic model, whether or not the firm has ever: (a) co-authored an article with a university scientist and (b) applied for (an eventually granted) patent with non-patent references, where these references are used importantly to cite scientific articles and other scientific materials. 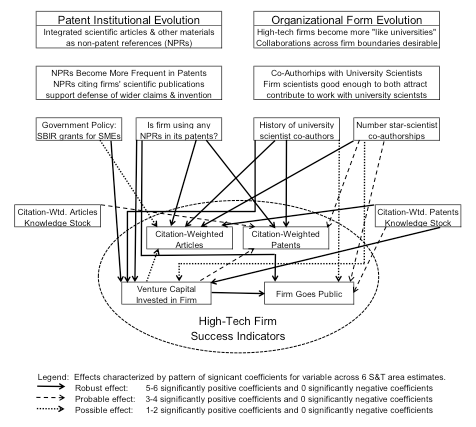 Both were robustly positive and statistically significant across four measures of U.S. high-tech firm success (publishing, patenting, obtaining venture capital, and going public) for six broad S&T areas (bio/chem/med, information technology, nanotechnology, semiconductors, other science, and other engineering). Star scientists publication as or with firm employees, SBIR grants received, and citation-weighted patents and articles all played comparatively supporting roles in the empirical estimates. 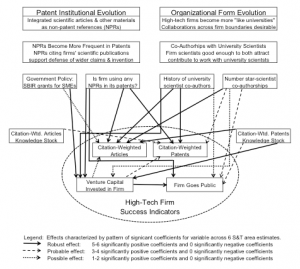 We concluded that the most successful high-tech firms have adopted a strategy of operating near the edge of the scientific envelope where high levels of tacit knowledge provide substantial natural excludability reducing or preventing entry of imitators, both by doing basic science themselves with university scientists and by implicitly including this knowledge in patents through non-patent references. Abstract: Human-centered design is a process of considering and balancing the concerns, values, and perceptions of all the stakeholders in a design (Rouse, 1991, 2007). This presentation will elaborate the concepts and principles of human-centered design in the context of innovation. Invention is the creation of a new process or device; innovation is the introduction of change via something new (Rouse, 1992). Motivations for change go far beyond the existence of an invention; consequently, the vast majority of inventions never contribute to innovations (Rouse, 1993, 2001, 2007). Motivations include aspirations for substantial improvements of the validity, acceptability, and viability of new products, services and, in general, solutions. When key stakeholders are not open to purely technical arguments about validity, acceptability, and viability, we have found that interactive visualizations can play an invaluable role (Rouse, 1998, 2007, 2015, 2016). This has led to the general notion of policy flight simulators (Rouse, 2014, 2015, 2016). Numerous examples will be presented to illustrate how interactive visualizations embedded in policy flight simulators have enabled innovations with diverse stakeholder groups. Bio: William B. Rouse is the Alexander Crombie Humphreys Chair within the School of Systems & Enterprises at Stevens Institute of Technology and Director of the Center for Complex Systems and Enterprises. 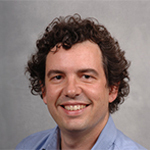 His research focuses on understanding and managing complex public-private systems such as healthcare delivery, urban systems and national security, with emphasis on mathematical and computational modeling of these systems for the purpose of policy design and analysis. 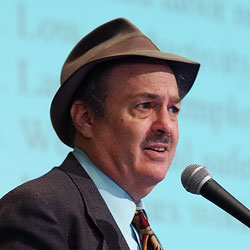 Rouse has written hundreds of articles and book chapters, and has authored or edited many books, including most recently Universities as Complex Enterprises (Wiley, 2016), Modeling and Visualization of Complex Systems and Enterprises (Wiley, 2015), Understanding and Managing the Complexity of Healthcare (MIT Press, 2014).